Every single choice you make for your home décor does somehow reflect your own personality and artistic visions. After all, it is the specific type of flooring, lighting, furniture, curtains, area rugs, accessories and decorations that give your home its distinctive character and special feeling of warmth and coziness. There are many different kinds of furnishing and interior design options that would work just fine in your space, but the ones you have chosen make it your own “sweet home”. When it comes to the best furniture for your place, you can choose from a great variety of excellent options that will allow you to express your individuality and style. If you opt for wooden furniture – the furniture of choice for the majority of people around the world – it will be the specific type of wood you select that will define the character of your home décor. The different kinds of wood add different degrees of warmth, emphasis and beauty to the surroundings, depending on the specific hardness, grain and color of the wood. All the different types of wood for furniture can be classified as either hardwoods (which come from leaf-bearing trees) or softwoods (which come from conifers). Each individual wood type, however, has its own characteristics that make it suitable for different kinds of applications and uses. To decide on the best wood for your furniture, you may want to refer to the comprehensive guide below – it provides valuable information on the most popular kinds of furniture woods, their specifics and value. Hardwood trees grow much more slowly than softwood trees which results in denser wood, greater durability and, consequently, higher value of the hardwood products. Items made from hardwoods are likely to withstand years of wear and tear and retain their gorgeous look and feel throughout time. Due to their natural resistance and beautiful grains, hardwoods are typically used for solid, high end furniture pieces. They are more expensive and higher rated than softwoods. 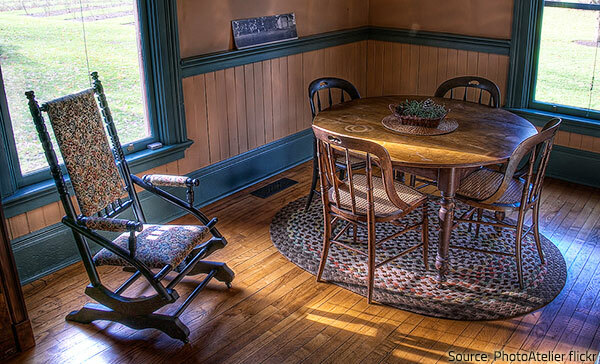 Even though most hardwoods are dark in color and very hard, this is not always the case. Oak furniture immediately becomes the centerpiece of any room. Red oak, which ranges from light brown to pinkish red in color (always with a pronounced reddish tint) and has a swirling, wavy grain. Extremely durable and often cut in a way that makes it resistant to warping, oak is usually used for solid wood furniture, designed to last for generations. It is highly abundant and therefore moderately expensive, despite its high quality and unique grain (red oak is usually less expensive than its white counterpart). Because of its great strength and beauty, oak has become the most popular type of wood in furniture making. One of the most valued types of hardwoods, cherry is very smooth and stunningly beautiful, with a fine texture and even grain. Its color varies from light brown to darker brown, with a warm red hue. Cherry wood is known to darken with time to richer reds and browns (the exact hue depends on the actual age of the furniture piece and on the amount of natural light it has been received), so vintage cherry furniture usually appears dark in color. Cherry is close-grained and does not require a filler. It is a very strong, hard wearing wood, which resists warping and checking and lasts for many years without losing its gorgeous look and feel. Besides, cherry wood complements most other kinds of woods and works well with other furniture pieces and elements of the home decor. Cherry wood is very easy to carve and polish, which makes it perfect for manufacturing fine furniture pieces (carved chairs, clean-lined Shaker-style tables and cabinets, etc.). Cherry is commonly found in antique furniture (it has even been called New England mahogany) and is often used to craft 18th century, Colonial and French Provincial designs. Stylish and durable, cherry is one of the most expensive native woods in furniture making. Mahogany wood imparts unparalleled grandeur to the ambience. 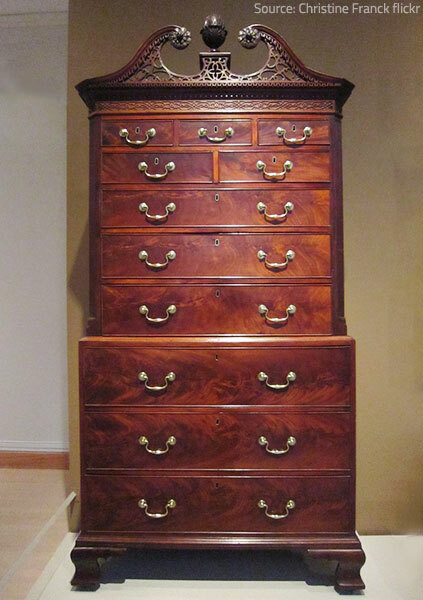 Mahogany has long been considered a symbol of elegance, luxury and sophistication. 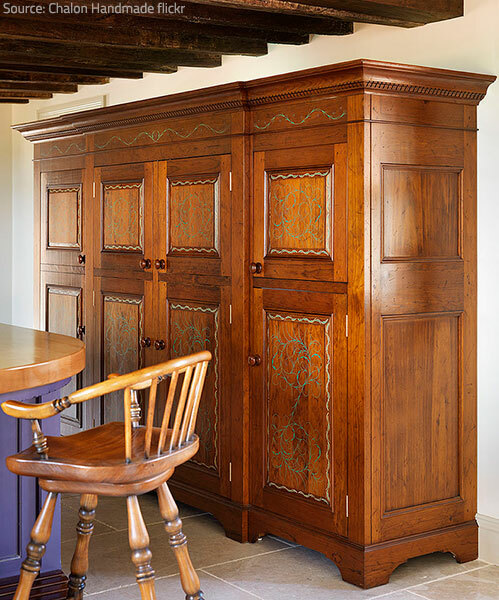 It is one of the most treasured furniture woods in the world, traditionally used for fine furniture and high-end veneers. Mahogany varies in color from medium brown to deep red-brown and dark red, with a very distinctive and attractive grain (it may sometimes display stripe, ribbon, rope, ripple, mottle, or blister figures that are very beautiful and greatly valued). Mahogany wood is very strong, with a uniform pore structure that makes it resistant to moisture and suitable for various outdoor applications. It is an excellent carving wood and finishes well. Mahogany is very versatile and very popular, despite its considerable price (mahogany is limited and quite expensive). It is extensively used in Georgian and Victorian furniture reproductions, as well as in the crafting of high style contemporary furniture. Maple is a strong and dense wood that makes beautiful, durable furniture. It is creamy to light brown in color, with a distinctive reddish cast. The pale natural color, however, easily accepts stain or paint, so you can find maple items in a wide range of hues. Maple wood has a fine texture and natural swirls and twists in the wood grain. The grain is usually straight, but also occurs in bird’s-eye, curly, or wavy patterns. Such rare types of maple woods were used to manufacture American furniture in the beginning of the 20th century. Today, any remaining pieces are considered to be valuable antiques. In modern times, maple that has a curly grain is usually used for violin backs while maple wood with burls, leaf figures, and bird’s-eye figures is extensively used for veneers. However, because of its extreme hardness, maple wood is somewhat difficult to work with. Maple is heavier and more durable than most other types of furniture woods, so it is often chosen for heavy-use items, like dressers, kitchen cabinets, and bedroom furniture (and even bowling alley floors!). Maple wood is not only extremely strong but also moisture resistant, so it can withstand many years of wear and tear. Besides, it takes dark stains well, so maple is often stained to mimic pricier woods, like cherry or mahogany (maple itself is moderately expensive). Walnut is strong and durable, without being excessively heavy. It has excellent woodworking qualities and can take intricate carving. The wood is light to dark chocolate brown in color, with dark streaks that add a lively character to walnut furniture pieces. The grain is straight in the trunk, but becomes wavy toward the roots, so walnut stumps are commonly used as a source of highly figured veneer. Stable and versatile, walnut is one of the most popular cabinet making woods. It is especially favored for 18th century reproductions, head-boards, ornate dining tables, and mantels. Solid and beautiful, walnut furniture perfectly complements any interior decor. Walnut is very beautiful and holds up well over time, so it has been used for the crafting of fine furniture since Colonial times and is still in high demand today. Have in mind though that it is also one of the more expensive woods in furniture making. Extremely durable and stunningly beautiful, teak has become one of the choice furniture hardwoods. It is very strong and carves well, but because of its high value, teak is more often used for decorative veneers than for solid furniture. Teak varies in color from rich golden-yellow to dark brown, with dark and light streaks. It may show straight grain or may be strongly figured (mottled or fiddle back figures being the most common ones). Teak is very resistant to rotting, very durable, and very attractive. However, it is also very expensive as the tree must be quite old in order to harvest the wood. Ash is a strong, heavy hardwood, highly valued for its excellent bending abilities – it’s primarily used for structural frames and bent furniture parts that require maximum strength. Ash veneers are also very common. Ash comes in a wide range of colors – from creamy white or gray with a light brown tint to a dark reddish brown. It has a prominent open grain that resembles oak. Ash burls have a twisted, interwoven figure that gives ash wood furniture a unique, beautiful look. Ash wood is relatively inexpensive and quite attractive, which makes it the material of choice for various outdoor and indoor applications. Beech is a strong, heavy wood with a fine, tight grain and even texture. It has a very high resistance to shock and bends as easily as ash. Therefore, beach wood is often used for frames, chair and table legs, drawer bottoms, sides and backs of cabinets, and a variety of bent furniture parts. Half round cut and quarter sliced beech veneers are also very common. All kinds of wooden furniture are characterized by a specific feeling of warmth and coziness. Beech has reddish brown heartwood and light sapwood. It takes staining well and is often stained to look like mahogany, cherry, or maple. 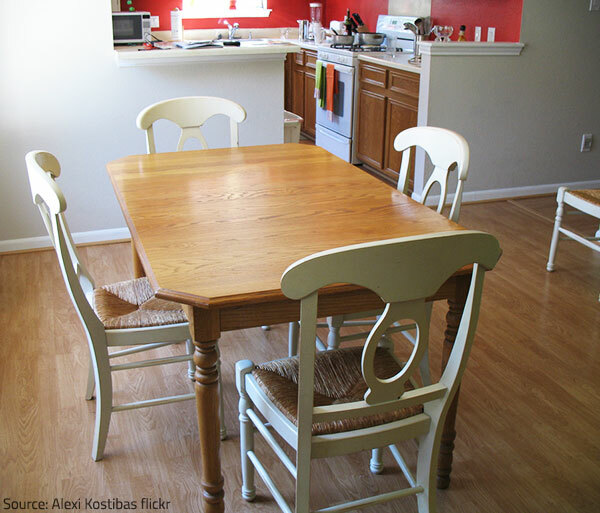 Beech wood is relatively inexpensive, yet very durable and easy to polish because of its smooth finish. This makes it a very popular wood for furniture that is highly appreciated for its warm feeling and casual look. Hickory is one of the heaviest and hardest woods available. It has a straight, indistinct grain without much figure. The wood varies in color from reddish brown to a warm medium brown (sometimes, even light cream with occasional darker streaks). Because of its remarkable toughness, hickory wood is often used for structural parts where strength and thinness are required. It is also used in rockers, Windsor chairs, lawn furniture, and decorative veneers. Hickory wood comes at a moderate price. Elm has excellent bending qualities and is widely used in all types of wooden furniture (especially for bent woods). It is light brown to dark brown, with pronounced red streaks and a distinct grain. 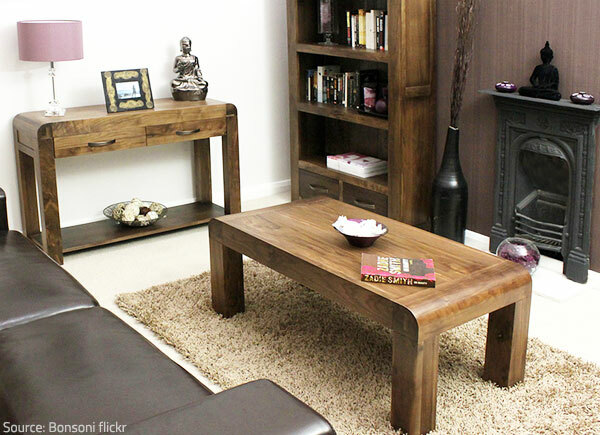 Elm is quite rare, so elm wood furniture is both hard to find and expensive. Many other types of wood are used in furniture construction as well – Sycamore, Rosewood, Birch, Poplar, Basswood, etc. Most of them are very common, inexpensive, and usually used in combination with rarer and pricier woods. Softwoods tend to be less resistant to wear and tear and less expensive than hardwoods. 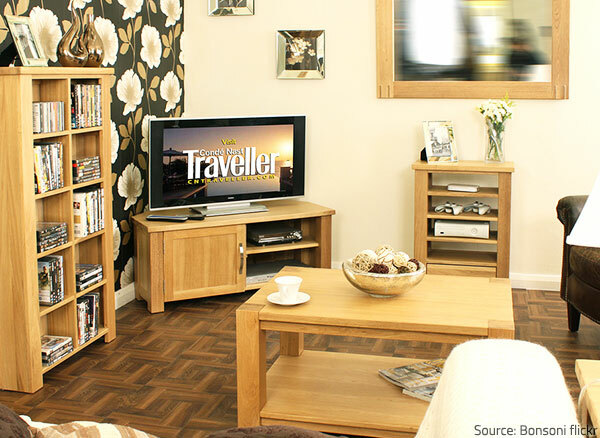 They are readily available and very popular for manufacturing low-cost furniture. Softwoods are often used for making inconspicuous parts of furniture (such as the insides of drawers or the backs of cabinets) that is otherwise crafted from higher quality woods. They are usually stained to match the more costly hardwood furniture elements. Pine furniture can be found in almost any home in the country. Pine is a soft, lightweight wood that is very popular for furniture making. It’s readily available, inexpensive, and easy to work with, so it has become one of the basic woods of modern furniture. Pine wood varies from creamy white to yellow-brown in color, with occasional dark brown knots and streaks. Knotty pine is often used for decorative effect. Pine has been widely used in America ever since the early 17th century (it was used extensively for Colonial furniture). Nowadays, pine is commonly used for provincial furniture and rustic pieces, like farmhouse-style tables. Besides, it is the primary wood used for unfinished furniture. Pine woods usually need a primer or a sealant before staining or painting in order to achieve an even finish. The pale finish, however, is great for staining which allows pine to blend well with other woods (making it the ideal solution when you need a new furniture piece and want it to match the existing items in your home). Pickled, whitened, painted and oil finishes are often used on pine wood which is straight grained and lacks figure. It develops a nice, rustic patina from age and use. Pine wood is soft and prone to denting and scratching. It resists shrinking and swelling, but it is much less durable than hardwoods and, therefore, not suitable for furniture that sees a lot of use. Pine is low-cost and very practical, and it takes paint well. So, it’s no wonder that pine furniture is so common. Cedar is a knotty softwood with a beautiful grain. It is red-brown in color with lighter streaks and knots. Cedar has a distinctive scent which deters moths and insects, so it has become a very popular choice for chests and wardrobes. Simple cases, boxes, and storage closets are also constructed from this light, brittle wood. Cedar furniture should be left unfinished on the inside (so that the owner can take advantage of the insect-repelling properties) and treated with a clear finish on the outside. The wood should not be bleached or stained. Cedar is naturally weather resistant and great for outdoor projects. It is moderately expensive. Other types of softwoods, such as Redwood, Spruce and Firs, are also used for crafting wooden furniture (especially for outdoor application). So, to sum it up – it is the hardness, grain, and color of the wood that determine the strength, durability, appearance, availability and cost of the wooden furniture. All you need to do is pick the type of wood that best suits your lifestyle, your personal preferences, and your available budget.